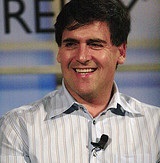 Dallas Mavericks owner and tech mogul Mark Cuban has perhaps the most interesting way of donating to charity of any major philanthropist. Every time the NBA fines him, he matches that fine with a donation to charity. During his 14 years as the Mavericks’ owner, this practice has resulted in $1.9 million in donations to charity. In typical Cuban fashion, Mark said it was his “proper farewell" to retiring commissioner David Stern, and has now announced that the matching $100,000 donation will go to the iBelieve Foundation, which raises money to research a cure for a rare condition known as mucopolysaccharidosis, MPS II or Hunter syndrome. The reason Cuban chose this particular cause was because of personal connections; iBelieve’s founder, who is one of 2,000 worldwide who suffers from the disease, was a childhood friend of Steve Nash, who introduced him to Cuban shortly after Cuban bought the team. It wasn’t his first donation to the organization either; in 2010 he gave $125,000 as part of a bike-ride fundraiser that was held in Vancouver to benefit the organization. "I know all the money goes right to the cause,” Cuban told ESPN. “He's really always made a difference in what I'm trying to do,” said iBelieve’s founder, Simon Ibell. “It means a lot, not just to me personally but for all rare diseases." Perhaps in the future, we’ll see Cuban open his wallet a little further for similar causes, but a lot of that may hinge on the causes his personal friends support.